As with No Country for Old Men, the Coen Brothers called upon Carter Burwell to score its quasi-thriller comedy, Burn After Reading. While the movie plays the genre for laughs, Burwell, their cinematic foil, plays it straight. He’s said he looked for inspiration in Jerry Goldsmith’s percussion-oriented score to the laugh-free zone that was Seven Days in May, directed by the late great John Frankenheimer. In other words, where No Country was extremely silent (more details at disquiet.com), Burn After Reading is loud and present. 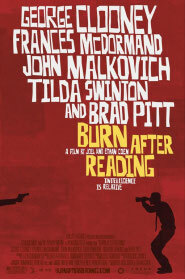 One graphic-design side note: the poster for Burn After Reading shares with that of Burwell’s preceding film-score work, Before the Devil Knows You’re Dead, the classic Saul Bass-style text treatments from The Man with the Golden Arm, Anatomy of a Murder, Vertigo and countless other Hollywood classics — all films with excellent soundtracks, suggesting something of a music-typography correlation. First a few seconds on electric guitar, which quickly fades. Later a deep hum surrounding a ringing piece of serrated metal. Then more guitar, tinged with feedback that comes close to matching the texture of the metal. Later on, single notes from what sounds like an acoustic guitar, plucked in the darkness, and then subsumed by more darkness. Then mixes of these elements, the tensely plucked guitar heard against the drone, and so on, and so forth, always with these long pauses — long enough to suggest that the piece is, in fact, over — in between. 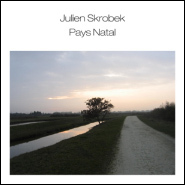 This is how Pays Natal by Julien Skrobek proceeds: slender sound pieces that follow one another, occasionally combining, for a little over half an hour. The result (MP3) is an exercise in which the roles of silence and music are, by most standards, reversed, and the mind is left to keep track of the elements, thus requiring close concentration. 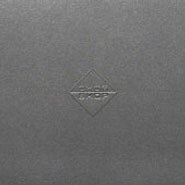 More details at the releasing netlabel, restingbell.net. TGIF met DIY a little over a week ago, on September 19, at the music-tech store/salon Robotspeak in the Lower Haight district of San Francisco. Donald Bell (aka Chachi Jones) and other Robotspeak friends and staff hooked up a little project that was part lo-tech experimentation, part audio-video mashup, and part urban prank. At around 7pm, the Robotspeak front gate was locked, and the front window, which usually sports objects like Ableton boxes, antique oscillators, and Bell’s own circuit-bent Speak & Spells, was covered with a curtain. But by sunset, 7:20pm, the gate was unlocked and the Robotspeak Irregulars were at their stations. 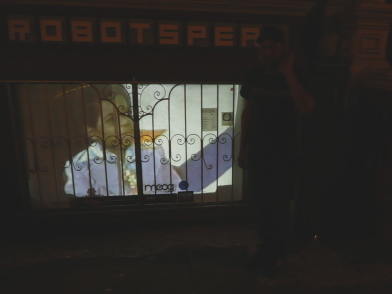 The set-up was simple: inside the store sat a primed projector looping moving goofy, sometimes distorted, images (of Gary Coleman, seen below, as well as Flavio), while a PA was set to squawk noisy bits of sound. 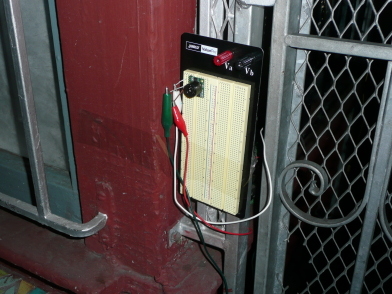 Both audio and video were tied to an ultrasonic sensor set into a circuit board, seen below, which fed into a MacBook running a homegrown software patch, written in the popular Max/MSP toolkit. The sensor served as a proximity monitor, so each time people walked by — headed toward a good sausage at Rosamunde, or a beer at the Toronado — they momentarily triggered the system, which shot onto the screen the current status of the video, and simultaneously turned on the sound. The contraption required some tweaking, like moving the circuit board to the outside of the store, because it wasn’t working through the plate-glass window. Also complicating matters a little was that a light drizzle began to fall, for the first time in what seemed like months. Still, busy Haight Street did its part, offering a steady stream of unwitting participants. 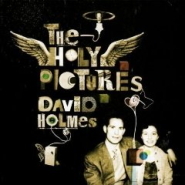 (1) Holmes Between Features: There’s a whole lotta pop on The Holy Pictures, the new full-length from David Holmes, the DJ better known as the composer of scores for films, many of them by Steven Soderbergh (Out of Sight, the Ocean’s trio). For example, both the album’s title cut and its “I Heard Wonders,” the latter of which opens the set, could be some dopey post-Bauhaus, pre-My Bloody Valentine lushness. That depiction holds also for the instrumental stuff on Pictures, like the upbeat, ’80s kick of “Melanie.” Fans of his scores will take comfort in the more atmospheric instrumentals, cuts like “The Ballad of Sarah and Jack,” “Hey Maggy,” and “Theme/I.M.C.” — all of them are heavy on melody, but are still more savory than sugary. And then there’s one truly serious expanse of sound design: “Birth,” Holy Pictures‘s penultimate cut, a thrillingly slow run of tide-pool placidity that briefly rouses itself, as if reflecting some brilliant object flying overhead. (2) Rust Never Sleeps, the Remix: The Oxide that serves as the title to the recent album by Chop Shop, on the 23five label, is no figment, no metaphor, no mere familiar nod to natural, organic dissolution in our age of cold, digital meditation. It’s all too real, this oxidation. The title refers to the “damage. decay. loss.” — as the brief liner note puts it — that came to an archive of old audio tape belonging to Chop Shop, a pseudonym of sound artist Scott Konzelmann. To rectify the destruction by accident, time, and neglect, Konzelmann dove into the ruins of his archive, not to reconstruct the original material (it wasn’t, one imagines, salvageable) but to appreciate those ruins in their own right and on their own terms. The result is a CD consisting of one single track, divided into distinct segments of droning, noisy static that are the true sound of audio damage. There is white noise that sounds like the gaping maw of some malevolent spirit, and wisps of ether that are as soothing as an afternoon breeze. The lesson is clear, the passing of time brings both sorrow and comfort. That the album progresses from the desolate to the refined, from noise to quietude, suggests that Konzelmann has made peace with his loss. If nothing else, it has proven, as a result of this stark recording, to be our gain. (3) Old Time Beats: Just last week (disquiet.com), the new Metallica album, Death Magnetic, had me dreaming that producer Rick Rubin, fresh from time-warping the famed metal band back to its potent mid-1980s style, would next turn to the Beastie Boys, unwind countless hours spent jamming in skate rinks, and re-produce them circa the tape-looped, sample-mad antics of that same period — for reference, their debut album, Licensed to Ill, hit in 1986, same year a Metallica’s Master of Puppets, and two after Metallica’s Ride the Lightning. So-called underground, or “backpacker,” hip-hop has kept alive the groove of that period (and the slightly later, early-1990s sounds of Tribe Called Quest, De La Soul, and their ilk), but Metallica’s backward glance proves that you can go home again — not just to the vibe of an era, but to its techniques. For Metallica, that means breakneck rhythms, as well as instrumental excursions that aren’t verse, chorus, bridge, or jam — think of them as music’s fifth constituent part, its umami. The equivalent for the Beastie Boys and other hip-hop pioneers of that time (from the pop of LL Cool J to the agitprop of Public Enemy) is the taut, noisy quality of fetishized sound objects. 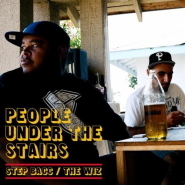 In last Sunday’s New York Times, Jon Caramanica’s “The Mining of Hip-Hop’s Golden Age” covered a slew of newer bands aping the old sound (nytimes.com), and lo and behold the vibrant new album from People Under the Stairs (not covered in Caramanica’s piece, which focused on New York), Fun-DMC, due out this coming Tuesday, September 30, is a veritable grab bag of true old-school rap entertainment. Which is to say, underlying it all are tracks built from short samples, repeated with an ear for the trance-like effect of the riff equivalent of a bon mot. Two of those instrumentals have been available for a month, thanks to a 12″ of Fun-DMC‘s “Step Bacc” and “The Wiz.” The former is the real keeper, from its wood-block knock of an opening, through its phased chanting, and those generous sluices of rhythm guitar. But there’s far more where that came from. 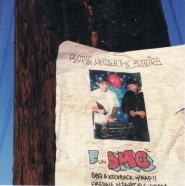 Fun-DMC packs 20 cuts, so here’s to more 12″s. (4) Downstream Coded Jazz: This week’s top Disquiet Downstream entry is the reworking of the classic jazz piece “St. James Infirmary” by San Francisco-based programmer and art gallery proprietor Christopher Abad, aka Aempirei (MP3, disquiet.com). it was loosely inspired by georges rodenbach‘s book bruges-la-morte, not so much the story, as the atmosphere of the text. i began by notating every sound in the book as well as every color in sequence, and then used the lists to generate a sound work, a text work, and a set of images. 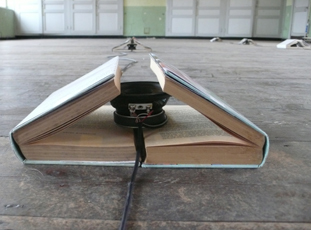 the text and images appear in the form of dust jackets, which frame the speakers playing a 13 minute audio piece through 15 speakers (and the images are mostly from the backgrounds of some of the old music photos i typically run on airforms). 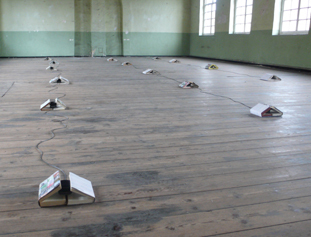 rather than create an illustration of the text or a work that conceptually fits cleanly into a single resolve related to the text, the piece presents numerous paths through the same information, allowing the sounds in the book to manifest themselves in different forms (i.e. as sound, text, and image). my main interest is in creating a space of intimate wandering, where one has to get close to the books not only to read and see, but to begin to approach the activity of listening with the same intimate response to reading and looking at small things. even though they are birthed from the same source, the text sound and images do not inform each other as much as they offer different paths of experience. More on the festival at happynewears.be. 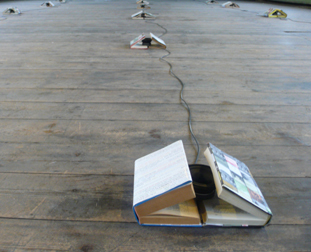 Other installations were by Aifoon, Sofia Bustorff, Clea Coudsi & Eric Herbin, Ludo Engels, eRikm, freq_out 7, Michael Graeve, Hans Peter Kuhn, Jacob Kirkegaard, Mieke Lambrigts, Stefaan Quix, and Minoru Sato.